Currencycloud’s Bulk Upload functionality provides the capability to make conversions and payments in bulk through the Currencycloud Direct application. This happens via a file upload (.csv) containing payments, conversions and/or beneficiary information through the application interface. Please see below for further information and if you have any questions, please contact us at [email protected] or speak to your Relationship Manager. Bulk upload begins by selecting the required file. After the file is validated, i.e. 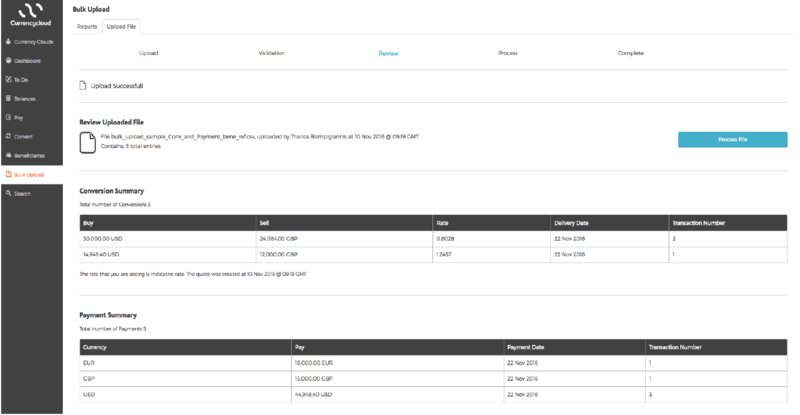 it is in the right format (.csv) and contains all the required information for payments and conversions, the file is then processed and the conversions and/or payments are executed. 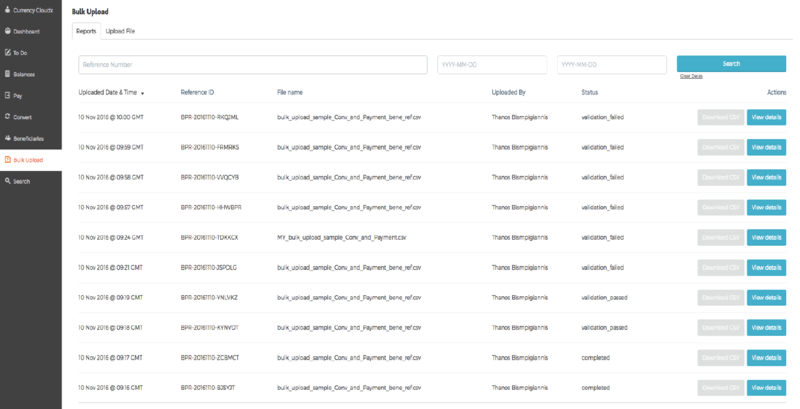 The history of bulk upload activity is available to the user through the Currencycloud Direct application UI. The file format that is used for the bulk upload of payments and/or conversions is CSV. The first line of the CSV file must contain the headers of the different fields provided in the file. In Appendix A, you can find all the different values that can be provided through the upload of the CSV file, with the corresponding header text. Note that headers are required in order to successfully process a file. The headers should have the exact same spelling as those provided in Appendix A. If the headers provided do not exactly match the expected ones, a validation error will occur and it will not be possible to process the file any further. Depending on the account setup (Cash Manager Enabled or not), each line of the file may contain a conversion, a payment, a payer, a beneficiary or a combination of these entities. Note: If Microsoft Excel is used for the file creation/editing, please ensure that all the fields are formatted as “Text” in order to avoid any auto-formatting of numbers that could result in a validation failure. When uploading payments, existing beneficiaries on the system can be used. In order to reference the correct beneficiary, the “beneficiary_external_reference” field should be used. The first time a beneficiary is paid, the external beneficiary reference along with all the beneficiary details must be provided on the CSV file. For any follow up payments, just the external beneficiary reference value is needed. In the instance that the beneficiary details need to be updated, the external beneficiary reference value needs to be provided along with the values of the fields that need to be updated. Note that only the fields that require updating are needed, all other fields that are already stored on the system, are not required. As an example, if the bank account_number of an existing beneficiary has changed, the only two fields needed to update it through bulk upload are the external beneficiary reference and the new account_number. If these values are provided in the file along with payment instructions, then the beneficiary will be updated first and then the payment will be made based on the updated beneficiary. On this screen, the history of bulk upload activity and the status of past bulk uploads can be found. The user can filter the list of existing bulk uploads or search for a specific upload by using the search. By clicking on the “View Details” button for a specific bulk upload, the user is forwarded to a screen containing the details of the bulk upload or the list of validation errors depending on the status of the bulk upload. From the “Bulk Upload” main screen and more specifically from the “Bulk Upload” tab, a user can initiate the process to upload a file with payments and/or conversions. Through the “Upload File” tab users can start the process of uploading a new file. They can drag and drop the file on the relevant area of the screen or click on the “Browse” link to search for the file they want to upload. After a file is selected, the validation process starts. As soon as a file is selected for upload, the validation process starts. The screen will provide information on the progress of the validation process for the file. The user can navigate away from the page and return back later. As soon as the validation process is completed, an email notification is sent to the user, informing them of the validation process outcome (validation passed or failed). The user can navigate back to the “Bulk Upload” main screen and by selecting the corresponding bulk upload on the list they can see the validation process result (passed or failed). If there are validation errors, the user can see a list of the errors as well as information on how to resolve them. Based on this feedback the user should be able to update the file and re-upload it on the platform for validation. If no errors are found, the user can proceed further with the processing of the file by clicking on the “Process File” button. At this stage, the user is also able to see an overview of the file contents on the screen. After the user clicks the “Process File” button, the file is submitted and the user will see the progress on this screen. The user is able to navigate away from this screen and return back to the “Bulk Upload” main screen where they are able to check the status of the file processing. As soon as the processing is complete, an email notification is sent to the user, informing them of the process outcome. to_amount If you know the exact amount you want the beneficiary to receive, please provide a value in this field Number that can contain two decimal places. If you don’t specify a to_amount, you must specify a from_amount. Please do not specify both. bank_account_holder_name The exact name of the beneficiary on the bank account you are paying to. Warning – if this differs to the name the bank has on record, they may reject the payment. Up to 50 characters. Mandatory for payments. payment_type You can make a “priority” payment which is fast and more expensive, or a “regular” payment which can be slower but is cheaper. The value of this field should be either “priority” or “regular”. Field with options of “priority” or “regular”. Mandatory for payments. charge_type When payment_type=’priority’, depending on the account setup, there is the option to select if the payment should have charges ‘ours’ or ‘shared’. In the case of ‘ours’ the payment cost is higher but the payment amount will arrive on the beneficiary account in full. In the case of ‘shared’, payment costs are lower however any charges are deducted from the payment amount, so the payment may not arrive in full at the beneficiary account. Field with options of “shared” or “ours”. Optional for priority payments. purpose_code When initiating cross-border payments, the central bank of the country may require a purpose to be included with your transaction in order for your payment to be accepted and processed. If a payment purpose code is required but not provided, your payment may be delayed or rejected by the beneficiary bank.Mandatory for specific currencies and countries. reference A payment reference which we will attempt to pass to the beneficiary, but may not arrive due to limitations in the banking network Can be up to 50 alphanumeric characters long, but support for this depends on the banking network in the destination country. Mandatory for payments. reason The reason for the payment Can be up to 50 alphanumeric characters long. Mandatory for payments and conversions. bank_name The name of the bank receiving the funds Will be automatically populated by us if you specify bic_swift, IBAN, aba or sort_code, otherwise it may need to be provided on the file. beneficiary_external_reference A beneficiary reference that is known to the user, e.g. the beneficiary reference/id used in the users external system/platform String – Required if a payment is made to an existing beneficiary OR if the user wants to update an existing beneficiary record. Please see below for the beneficiary rules for each payment type, then for each country in alphabetical order. More information related to the payment requirements can be found on the Payment Guides. If you want a payment to reach the beneficiary as soon as possible and you don’t mind paying for an international wire transfer, you should request a priority payment. beneficiary_address First line of address including building number or name. This should be the legally registered address of the company, or primary residence of the individual who is receiving the payment. payer_address First line of address including building number or name. This should be the legally registered address of the company, or primary residence of the individual who is making the payment. If a payment purpose code is required but not provided, your payment may be delayed or rejected by the beneficiary bank.Mandatory. The list of codes for payments to UAE can be found on the relevant support article. purpose_code When initiating cross-border payments, the central bank of the country may require a purpose to be included with your transaction in order for your payment to be accepted and processed. If you want to send funds using a cheaper method and ensure the amount of money you send arrives with your beneficiary, then you should make a regular payment. Please see below for the specific beneficiary rules for each destination country Currencycloud currently support regular payments to. These rules are in addition to the mandatory fields mentioned in the CSV File format described earlier in this document, which has been omitted from the list below in the interests of brevity. aba The bank identifier used in the USA, known as the American Bankers Association number 9 digit number and mandatory. Please take care to ensure the ACH routing code is supplied and not the Fedwire or Wire Transfer alternative. beneficiary_address First line of address including building number or name.